Do you ever feel exhausted or anxious after spending time with a stressed-out person? Maybe your friend is dealing with work-related worry or your child is struggling with school work. Whatever the case may be, those around you can cause secondhand stress. Research is proving it’s even more powerful than we once thought; resulting in chronic fatigue, anxiety, and depression. Research at the Max Planck Institute for Cognitive and Brain Sciences and Clemens Kirschbaum from the Dresden University of Technology found that being exposed to someone in a stressful situation can trigger stress responses in your own body. Their study showed cortisol levels spiked in 95 percent of people who were under stress. But you probably guessed that someone being tested or observed may have some anxiety, right? The interesting component of this study was the stress of the observers. Those who were watching through a one-way mirror, were also feeling the stress. Of those observing the stressed-out subjects, 26% also showed a significant cortisol increase, and most observers reported feeling tense, anxious, and uncomfortable. The effect was stronger when the observer was in a relationship with the participant (40%). How does this affect you? Depending on your job, your family, and your relationships, you may find yourself interacting with stressed out or anxious people frequently, which makes you a candidate for someone suffering from secondhand stress. This doesn’t just effect you; those who love and care about you are also at risk due to your inability to manage it. You may think you’re a pro at pushing through the deadlines, drama, or doing it all, but your body suggests otherwise. Children are even more vulnerable to secondhand stress than many parents assume. A study at University of California, San Francisco, tested the impact for secondhand stress and children. Even when children are not in the stressful situation they feed off their parents energy and cues—their stress levels rise when their parents are under pressure. In the study, mothers were given anxiety-producing tasks to complete. Assessed with heart-rate monitors, the mothers’ levels indicated they were feeling significantly stressed. When reunited with their children, who were unaware of the experience their mothers had just faced, their heart-rate monitors mimics their mothers. Like Velcro, children can pick up on the stress of their parents or caregivers. 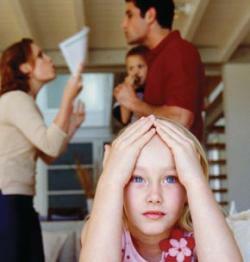 So how do you protect yourself and your children from secondhand stress? The more self-aware you are of stressful situations in your everyday life, for example people who trigger a stress or anxious response in you and environments that bring about stress, you can begin to make changes in how you respond to stress and manage it. There may be nothing to do about the initial stressor due the fact that life is tricky and unpredictable. But you can recognize how it feels in your body and what the trigger is. Many people are so used to running on autopilot that they cant seem to even recognize when their cortisol levels are through the roof or heart rate is up. This means that whether or not you feel like you can operate well under stress, your body, brain and others around you indicate otherwise. This is a problem. Parents who are doing everything they can to help their child feel good or get well—your stress about the situation is only increasing their stress. In order to really help your child you got to get the oxygen mask on yourself first. Get some clarity, get your brain and body healthy, talk to a professional, test your Neurotransmitters, do whatever it takes to get a more manageable level of anxiety (manageable for everyone,not just you—remember your brain may be telling you that you can handle it all, but your body is proving this to be false. When you take care of your side of the street, you can help others clean up theirs. 1) Identify triggers. Maybe its driving somewhere or dreading to make that phone call. Become more mindful of what your body feels like in situations that are prompting some discomfort. The next time you feel an increase in stress, slow yourself down enough to acknowledge. When you identify the specific trigger, name it and describe how it makes you feel physically and emotionally. Driving to work makes me frustrated. When I get stuck in traffic I feel worried about making it in on time. My body tenses up and I clench my jaw. 2) Adjust your autopilot response. Coping skills, cognitive behavioral techniques, mindfulness, and mediation can all be helpful for incorporating effective coping skills into your life, so that stress doesn’t continue to wear away at your body and mind, and negatively effect your loved ones. 3) Take control over your physical health. Make sure your brain and hormones are balanced, your stomach is in good shape, and your diet isn’t impacting your health. When you are getting the right nutrients and your body is able to absorb them, it helps you combat stressors. The more caffeine you drink, the more foods you eat that cause a histamine response in your system (anything you are allergic or sensitive to), or a diet heavy in processed foods will make you easily susceptible to stress. The more balanced your brain and body are, the more you can withstand whatever life throws your way. 4) Start a healthy habit to fight stress. Whether you love running, dance, yoga, journal, or mediation, do something to help you get rid of the secondhand (or firsthand) stress you experience. An everyday practice of doing 5 minutes of mediation, journaling, or stretching, with the intention to release stress, can make a big impact on your brain chemistry. Schedule YOU time: Whether that’s going to get a blowout, a manicure, or hitting up your favorite class at the gym, they matter. These fun tasks are as important as “writing that proposal” or “making a deadline” as they help clear your mind, release stress and allow space in your mind for new creative ideas to form. Many clients I have talked to had their best ideas while they were doing something they loved, not something they loathed. 5) Practice relaxation techniques: Therapists swear by combining deep breathing with visual imagery. It increases oxygen to your brain, physiologically calming you down and allowing you to move on quickly to the next task without getting overwhelmed. You can download a meditation on your iPod and listen to a trained therapist (soundstrue.com) guide you to decreased anxiety. Stress is palpable. When you are feeling overwhelmed others feel it too. Your partner, children, friends and coworkers would much rather be around a peaceful and happy person, rather than a frazzled one. Get a handle on it now before it takes over your life. Others will notice, and you will too.